An emerging Minerals and Waste Strategy being developed by Oxfordshire County Council poses a real threat of extensive new gravel working in Radley beginning within the next decade. The area that would be affected covers a large area of Lower Radley north of the boathouse between the railway and the river (see map below). This would be accompanied by working on the other side of the river in Nunehan Courtenay. a small amount of unextracted gravel*. Throughout 2010, Oxfordshire County Council has been running stakeholder consultation workshops on its Minerals and Waste Development Framework spatial strategy, to which District and Parish Councils, operators, and environmental groups have contributed. The consultation was carried out in the absence of clear targets as to how much material would be required (and in the mistaken belief that the regional targets, which threatened to increase extraction rates in Oxfordshire, had been abolished – see below). neither of these so that future minerals extraction would/could take place within any resource area (this is referred to as dispersed working). Perhaps not surprisingly, given that “existing areas of working” include a minority of parishes, and given the vociferous response from parishes in potential new working areas, the County Council’s Cabinet agreed on the 19th October to the recommendations of the Minerals and Waste Plan Working Group Group that the interim preferred strategy approach for mineral working in the short to medium term should be to concentrate in existing areas of working. This is bad news for Radley, which, despite having no extant permissions* for sand or gravel extraction, and no sand or gravel having been extracted in Radley since 2003 (and no significantamounts since before 1995) is currently defined as being in an “existing working area”. This is merely defined to be some contiguous area which includes some existing working (where, as noted, the definition of “existing” appears to be somewhat vague) and which does not conform to parish boundaries. 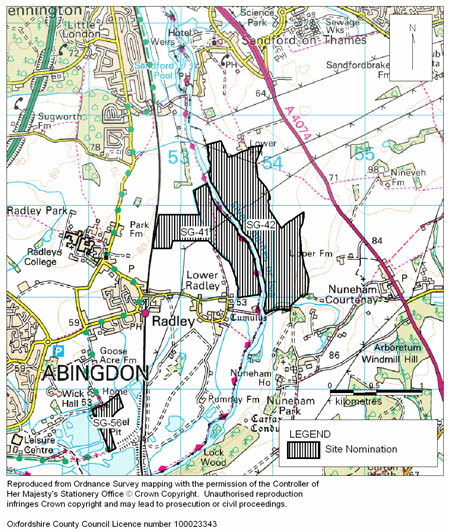 Most notably, the “Radley area” includes neighbouring Nuneham Courtenay from where it is proposed that gravel should be extracted within a large area on the far side of the river (SG 42) opposite proposed workings in Radley (SG 41). Both of these sites would involve the creation of new quarries and would impact local areas not affected by existing or previous extraction. Elsewhere, parishes across the County have formed alliances (see below) to fight any proposals that may emerge for gravel extraction in their particular areas. Radley (along with Nuneham Courtenay) seems to be in the unenviable position of being “piggy-in-the-middle”. Radley Parish Council has responded robustly along lines that, since Radley is not an existing area of extraction and has not been, in any significant sense, for over 20 years, none of the criteria supporting option (i) would apply to it. So far Radley Paruish Council has not received a reply from Oxfordshire County Council. The process has really only just begun. Public consultation on a preferred minerals strategy will take place in summer 2011 following an assessment of need. The ability of existing working areas to provide for the medium to longer term will be re-assessed when the requirement for sand and gravel supply has been established; and consideration will be given to new areas of working if the re-assessment indicates this is necessary. The Cabinet will consider a preferred minerals strategy for public consultation in February 2011. Following this consultation, the aim is to produce the Minerals and Waste Core Strategy proposed submission document by the end of 2011. This will be published for representations to be made and will then be submitted to the Secretary of State for independent examination by a planning inspector. It is expected that the examination hearings will be held in summer 2012 and for the inspector’s report to be received in the autumn. Under current legislation, the Inspector’s report will be binding on the Council. Once the Core Strategy has been adopted by the County Council, it will form part of the Development Plan. Whatever you think of it, it is important that Oxfordshire does set a clear policy (before the current one, embodied in the Local Plan, expires) on where gravel extraction will be permitted, otherwise they effectively lose the ability to refuse permissions and it would become open season for mining anywhere in the county. However, if for any reason, the prevailing Regional Strategy targets remain, or are increased, the spectre of extensive new minerals extraction throughout the County, not just in Radley, will emerge into stark reality. Following an assessment of the local minerals requirement by Atkins, the Minerals and Waste Working Group has recommended that the local supply requirement, upon which the Strategy should be based, should be (per annum) 1.26 Mtonnes of sand and gravel and 0.63 Mtonnes of crushed rock. This is a significant reduction upon regional targets, both existing and what would have been proposed. Furthermore the Working Group has recommended that the Radley and Nuneham Courtenay area be removed from the list of working areas under consideration, because “neither of the sites within it is likely to be deliverable”. A new area has been identified at Cholsey to make up any shortfall. *: The permission for extraction at Tuckwell’s quarry ran out in 2007. This permission was renewed to allow the removal of the small amount of remaining gravel, but subsequently withdrawn when Tuckwells refused to agree to the conditions. The remaining permissions covering areas K and L2 of the Radley Lakes granted under the 1948 interim development order (IDO) are now suspended because the operator has not undertaken an Environmental Impact Assessment as required under the Review of Old Minerals Permissions (ROMP) process. The suspension will remain until 11 February 2012 and, if the operator has not submitted a valid Environmental Statement by that time, the permission will lapse, permanently. *: This is because Oxfordshire, under the prevailing regional strategy, is required to provide minerals for use elsewhere in the region, including non-neighbouring counties. Minerals authorities are required to provide a 7-year landbank for sand and gravel, which means, that, at any time, reserves of this amount have to be permitted within the county, irrespective of actual demand. So reducing the annual target for sand and gravel from 1.8 Mtonnes to 1.26 Mtonnes, as is being proposed, would reduce the landbank by 3.8 Mtonnes – the equivalent of (not) granting permissions for between 1 and 3 new quarries.